Bomag BF 800 C pavers ... paving the asphalt base layer for the road. 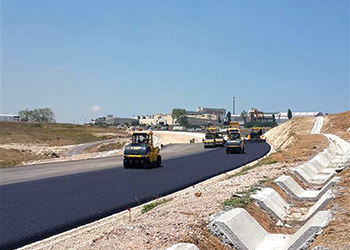 Turkish contractor Yener Asfalt put its trust in Bomag machines to build a section of a crucial motorway, where it is using four BF 800 C pavers with S 600 screed to successfully get the job done. 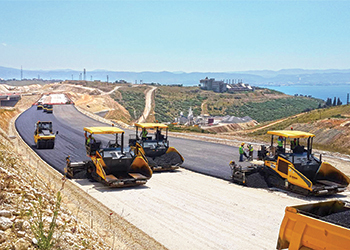 When Turkish construction company Yener Asfalt was awarded a contract on one of Turkey’s largest construction projects ever, it turned to Bomag machines to do the job. And the decision has paid off. Turkey is building close to 400 km of roads as part of this ambitious project that also includes the Izmit Bay Suspension Bridge, which extends 2,682 m in length with its longest span measuring 1,550 m. When complete, it will be the fourth-longest suspension bridge in the world. The bridge is being built by a multinational consortium. Yener Asfalt won the contract for the construction of the first motorway section to the bridge. It consists of an 8-km-long section paved with a total of 300,000 tonnes of crushed aggregate and 200,000 tonnes of asphalt. Such high paving rates demand not just quality, but endurance as well. “The company has relied on four Bomag BF 800 C pavers with S 600 screed to get the job done – and these are not the only Bomag machines that will be deployed in this major project,” says a spokesman for Bomag. The BF 800 C, weighing 21.3 tonnes and with a 135 kW engine and a theoretical capacity of 800 tonnes per hour, delivers extremely high pre-compaction values of up to 95 per cent by means of an infinite vibration- and tamper frequency. Bomag pavers ... highest pre-compaction values of up to 95 per cent. Yener Asfalt bought its first BF 800 in May 2012. It mastered challenging projects so well from the very beginning, that it expanded its paver fleet with a further BF 800 in each of the months April, July and October 2013. The construction of the Izmit Bridge is expected to be completed by 2016, and the entire highway in 2020. Until then, there is still some way to go for the four BF 800 Cs. “But that is no problem, thanks to the durability and simple maintenance of the Bomag pavers. The service intervals are remarkably long, and if there are any downtimes, Bomag offers carefully selected maintenance and emergency kits. “And it is not just the servicing of the BF 800 C that is extremely comfortable, but also the operability. The operating console and seat form a unit and can be moved to the left or right with an overhang of up to 60 cm. The Bomag Sideview system provides the driver with optimal visibility of the machine edge, hopper, auger and screed,” says the spokesman. In addition to the pavers, nine other Bomag machines are also in use at Yener Asfalt – a BW 120 AD-4 light tandem roller, four BW 161 AD-4 heavy tandem rollers, two BW 24 RH rubber-tyred rollers and two BW 213 D-4 compactor. In the compaction field, Yener Asfalt also relies on machines that guarantee optimal results and make no compromises on technology, quality and cost-efficiency. Headquartered in Boppard, Germany, Bomag is a global leader in the field of compaction technology. The company produces machines for soil, asphalt and refuse compaction as well as stabilisers/recyclers, milling machines and pavers. Part of the Fayat group, it has six branches in Germany and 12 independent subsidiaries, and more than 500 dealers in more than 120 countries.